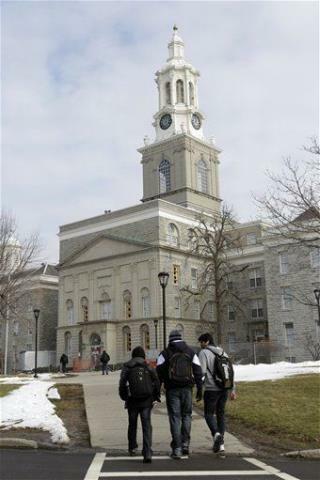 (Newser) – A University of Buffalo student was in critical condition after an apparent frat hazing gone wrong—a frightening event that could lead to criminal charges, the Buffalo News reports. Police say Sebastian Serafin-Bazan, 18, suffered a cardiac arrest after fraternity brothers told him to perform exercises from Thursday night to Friday morning. Serafin-Bazan, who had recently suffered respiratory problems, was reportedly carried onto the lawn of a residence associated with the Sigma Pi fraternity. "One of the fraternity brothers told us that they carried him outside to get him some fresh air after he fell and hit the back of his head on a coffee table," says a neighbor. "We were told he had the flu." A school senior says 20 people fled the scene before an ambulance arrived just after midnight. Very interesting all the vitriol & hate for Fraternities & Sororities from those who it seems only impression of greek life is from Animal House. Wow. 18 and having a cardiac arrest? Must've been a brutal task! How stupid have our kids become? Easy fix, ban fraternities and sororities.